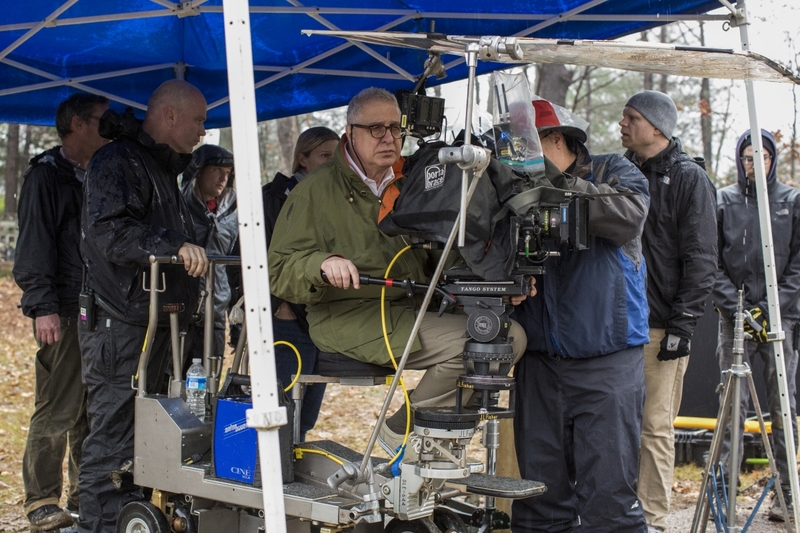 "I was born in 1948; I am a creature of post-war America," says Academy Award- and IDA Career Achievement Award-winner Errol Morris. Morris is the director of such films as The Fog of War and The Thin Blue Line, and the inventor of the revolutionary interview device known as the Interrotron. His latest work, Wormwood, will be running as a six-part series on Netflix beginning December 15; a limited theatrical release, launching the same date, was deemed "too episodic" to be eligible as a "film" for Oscar consideration. Further complicating just what this four-hour project is, Morris has taken his "reenactments"—which aren't really reenactments, but rather dramatizations of possibilities—to a whole new level. 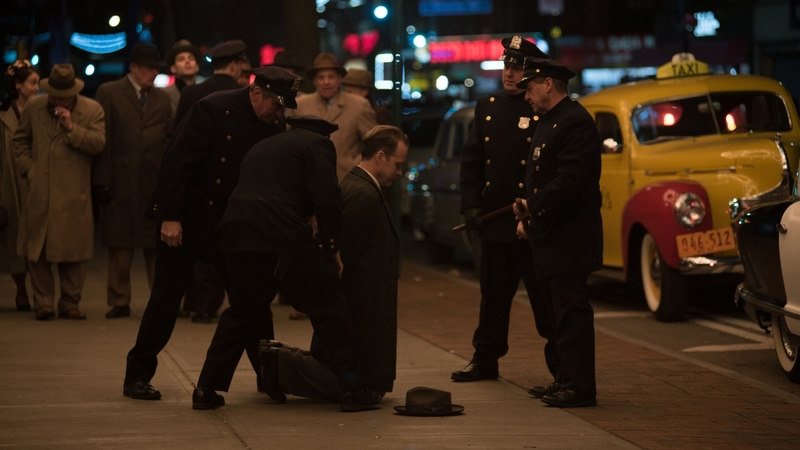 Wormwood sees him blending talking heads with dramatic scenes, featuring an all-star cast, including Peter Sarsgaard, Molly Parker, Bob Balaban and Tim Blake Nelson, in a way that has confounded critics as to whether it should even be called a documentary. A quick Google search finds Wormwood dubbed "a docu-drama," "a documentary fiction combo," "a hybrid miniseries," "a docu-fiction," or, as Morris himself has cutely referred to it, "an everything bagel." He has also retired the Interrotron, and is using 10 or more cameras simultaneously to capture the interviews he's done here. Wormwood tells the story of Eric Olson and his father, Frank Olson. In 1953, Frank Olson was a chemist working for the US Army on the development of germ warfare. Suddenly, seemingly out of the blue, the Olson family is informed that their father has jumped or fallen out of a 10th -story window of a New York hotel to his death. Eric Olson was only nine years old at the time. Then, just over 20 years later, in 1975, thanks to reporter Seymour Hersh's uncovering of nefarious goings-on at the CIA, which led to the Rockefeller Commission, the family learned that Frank had been unwittingly dosed with LSD a few days before his death as part of a mind-control CIA operation known as MKUltra. Eric has spent his entire life dedicated to—or better said, obsessed with—unraveling the twisted story of his father's death. The story continues through to the present, where Morris dons his detective cap (as a young man, Morris worked as a private investigator) to try and get to the bottom of the case and find proof that Frank Olson was, in fact, murdered by the CIA, as well as the reasons why. In a very real sense, as Morris explains, Wormwood is also the story of post-war America and what happened to America because of the Cold War, and how what it continues to haunt us today. "Eric says something really interesting: In post-war America, we created a kind of crazy war with ourselves," Morris explains. "The Cold War can be seen as a reaction to nuclear weapons, but moreover, it was a war of doubt and suspicion about ourselves and our own democratic institutions, which bred a kind of anti-democracy. There was a kind of hysteria—a feeling, on the one hand, that the world was on the verge of annihilation, in a way that wasn't true before. The existence of atomic weapons made unimaginable things imaginable, if not even possible. It became a kind of crazy fight for life, no matter how real or unreal it might be. And so it legitimized almost any sort of excess—the abrogation of civil liberties, foreign incursions of one kind or another, and a Central Intelligence Agency which was, for all intents and purposes, out of control. "Suddenly, lying becomes institutionalized in a way that is different," Morris continues. "It's as if we can't take the truth of what's going on, or the truth is so ugly, so frightening, that everything and anything becomes possible. And not only possible, but it becomes warranted. Eric says that we started lying to ourselves and allowing the government to lie to us in a way that jeopardizes everything that supposedly we stand for, and everything that democracy supposedly stands for. And, as such, I think it's a very, very important lesson for now, as well as the '50s." Morris had long been fascinated with the CIA's MKUltra program. He had several stories to choose from, and says he plans more stories from its files in the future, if not also an epilogue to Wormwood. He began working on one story, but when he wasn't able to obtain rights to tell it, he refocused on the Olson story. However, there had been a number of TV shows and several books written about the case, which made him somewhat reluctant. "But then," Morris says, "I talked to Eric and I immediately was interested in it without really knowing what I was getting into. I was certainly not aware of the element involving Hamlet, which really comes out of Eric Olson." How Eric's story mirrors Hamlet—the source of the film's title—is played with throughout Wormwood, which incorporates clips from Sir Laurence Olivier's 1948 film of the play. "I certainly was not aware of the role that Eric Olson had played in all of this over such an extended period of time," Morris says. "We're really looking here at post-war America, this huge of swath of history. That was compelling, as well—just peeling the onion, taking layer after layer after layer. To be honest, I knew very little about the Korean War going into this project. So I started learning about it—learning that we dropped more napalm on Korea than we dropped on Vietnam, that it was an incredibly brutal and violent war, and, if I.F. Stone [author of The Hidden History of the Korean War] is to be believed, it was a war instigated not by them, but by us! And we almost used nuclear weapons, which is ironic because that issue has come to the fore again 60-plus years later. So maybe a movie like this was an opportunity to learn about things I did not know about." Staying with the themes of post-war America, Hamlet and their connection to the Olson story, Morris adds that he's also deeply indebted to Eric for giving him the opportunity to think about the play. "The Olson story to me is really powerful because it approaches this story of post-war America on three separate levels. It approaches it on a family level, a personal level; it approaches on a governmental, federal level; and on an almost deeper level, a metaphysical level, about what it does to us and what it did to Eric—a feeling of rottenness. "I remember saying to Eric, at one point, that the most terrible thing about Hamlet for me is not simply that Claudius kills his father and that his mother was complicit in that murder. The most terrible thing is that he returns to Denmark and is surrounded by people who are his enemies. Everything that seemed okay was suddenly fraught with a whole layer of paranoia and doubt. There's a feeling of betrayal, multiple betrayals in Hamlet. I would call Hamlet a pre-noir noir. There's a feeling of dishonesty which pervades everything, and presages doom. One of the ironies is that I always wanted Peter Sarsgaard to play Frank Olson, and he was playing Hamlet at the time. The deal was cinched for me anyway, but the fact that he was playing Hamlet was just too good to be true." Morris calls the extent of the drama used in Wormwood "revolutionary," while critics wonder if it can still be considered a documentary. But what seems to be lost here, Morris notes, is that these noir-ish period sequences are not reenactments of fact, but are based on what have come to be called "the Colby documents"—written testimonies by various CIA and Army personnel who spent the last days with Frank Olson before he died, and, which Morris adds, "may be completely fake." The script was written by the editors of the film, Molly Rokosz and Steven Hathaway. "Nearly half of it was paired away because of budgetary considerations," Morris says. "I'm amazed that it actually does work. It's a real pleasure when you take a risk and the risk pays off. The actors had no idea how it was going to work or fit together. I'd like to say I knew exactly what I was doing, but I didn't. I was optimistic that it would work. "I think that Wormwood, in an imaginative way, is sort of addressing the problem of what's true and what's false in telling a story that has all of these ironic dimensions to it," Morris explains. "There are so many techniques that were innovative in Wormwood. I was blessed with having all this material available to me: all these home movies that were principally shot by Frank Olson; historical footage going back to the Korean War; interviews shot in a different way from interviews than I've shot before; the use of collage, both in the interviews and the graphics; and playing with the aspect ratio. It all takes it further than I have ever been before. I am very proud of the movie." Morris is also indebted to Eric for the use of collage in the film. When Eric wasn't pursuing the truth of his father's death, he was developing a technique to use collage as a form of therapy. Morris felt it fit perfectly with the themes and look of the film. "I've always loved collage, long before this project," he explains. "I was interested in Eric's collage theory. Collage is so much a metaphor for any kind of investigation; you're assembling bits and pieces to try to create a picture of the world. Sometimes pieces fit together and sometimes they don't. "The nature of documentary film," Morris continues, "is an investigation into how we can try to capture reality, how we can try to capture something truthful about the world. It's philosophical in nature, it's epistemological. It's trying to examine how we know what we know. How we have knowledge about the world. How we learn about the world. "It's the same question that I'm always asking: What does it mean? And this irony, which I learned from Eric, is not something I imposed on the material—the irony of, How much are we willing to sacrifice in order to know something? Knowledge comes with a cost. And to what extent is knowing something worth the price that we have to pay to know it? The other option is to live in a fantasy, but if you ask me if there's anything that makes us great, it's the pursuit of truth. It's the fact that we attempt to reach outside of ourselves and to know something about the world around us, and ourselves. "There are endless obstacles and impediments to finding the truth. It's an elusive goal. But here is something to remember: The world is out there, like an undiscovered continent, and our job is to go out and discover it. It's also the story of Wormwood. It's the attempt to reach outside of ourselves and learn about the world around us. It sounds a little vacuous or broad, but on some level, documentary film is of interest because it is in direct relationship to the world. When we make a movie—whether it's about the Vietnam War or about the death of Frank Olson—we're talking about something that really happened in the real world. And like all those things that happen in the real world, they're not just given to us. When I say that everything is a reenactment, a reenactment of reality we reconstruct inside of our heads, we're reaching from inside of ourselves out there into the world to try to understand what actually did happen, what actually transpired. It's not given to us. "For Galileo, it was to reach outside of himself and say, 'It moves! I don't care what the Vatican has to say about the nature of the solar system. For me, the Earth is not at the center of the solar system. It is the Sun.' This enterprise, which has moved the world forward, is at the heart of what makes—if this human enterprise is not just ultimately tawdry, it's what gives it purpose and dignity. And I still love documentary film, because you know what I am at heart? I'm a historian—not just interested in telling stories that are based in history, but ultimately examining the question of what is history and how do we know about it. And I hope Wormwood is a contribution to this." Wormwood opens in theaters in Los Angeles and New York, and premieres on Netflix, on December 15. Ron Deutsch is a contributing editor with Documentary. He has written for many publications including National Geographic, Wired, San Francisco Weekly and The Austin American-Statesman. He is currently developing a new documentary project in collaboration with the Center for New American Media.